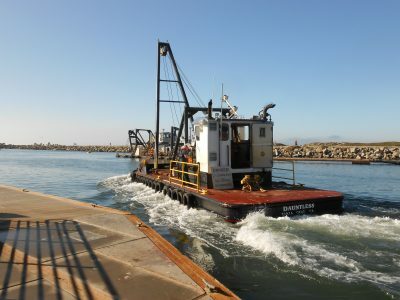 Crews moved Twin Lakes from her off-season mooring in the north harbor to the entrance channel on Monday, November 5, 2018, in conjunction with the low tide. On Monday, November 19, 2018, entrance channel dredging commenced. The typical dredge schedule is Monday – Thursday, with maintenance performed on Fridays. During dredging operations, pass Twin Lakes on the east side (Crow’s Nest side) of the channel unless otherwise marked. Stay at least 50′ from the dredge. Contact the crew for passing instructions on VHF channel 8. On Tuesday, October 9, 2018, north harbor dredging commenced. 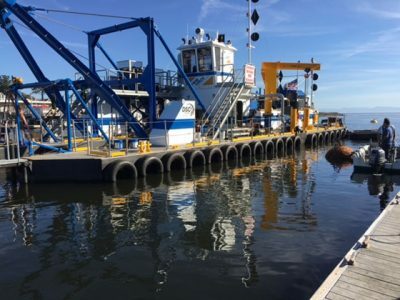 Crews are utilizing the Port District’s 8″ dredge Squirt. Dredging of fine-grained material is permitted through February 28, 2019, while dredging of sandy, coarse-grained material is permitted through April 30, 2019. Mariners transiting in the area are advised to read all gate notices and beware of submerged pipe and equipment hazards that may be present. Click here to view the areas proposed for dredging and the anticipated pipeline configuration in the north harbor. Dredging of the harbor is required because of the constant easterly movement of sand along our coast and thus, across our harbor entrance. Such movement is generated by the ongoing forces of waves and currents. The amount of material moved and deposited is directly proportional to the severity of current and wave conditions. This constant movement of masses of sand is termed littoral drift. Sand indicated by orange dotted areas, is carried down the San Lorenzo River and thence moved down-coast by wave and tidal action called littoral drift. 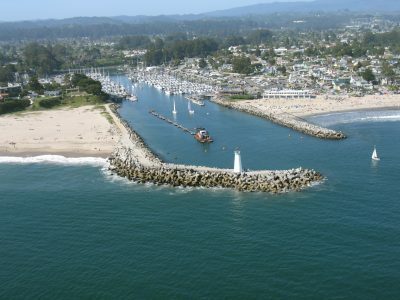 Constantly moving, the sand mass builds up against the west jetty and flows around it, shoaling the Santa Cruz Harbor entrance channel. 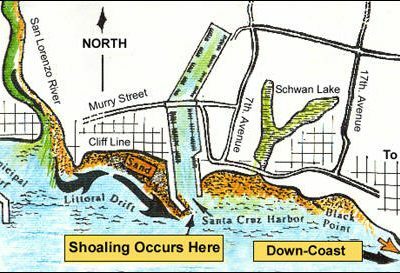 Impeding sand is then dredged from the entrance channel and deposited in the inter-tidal zone where the existing littoral drift carries it down-coast, nourishing those beaches east of the Santa Cruz Harbor entrance. Because of sand incursion at the mouth of the harbor, it is essential that an annual dredging effort be maintained to assure sufficient depth at the harbor entrance to permit the safe passage of vessels transiting the entrance. Shoaling conditions caused by littoral sand drift produce dangerous and unpredictable breaking wave formations at the harbor’s entrance. These breaking waves are extremely hazardous to incoming, and outgoing vessels and pose a particular danger to individuals walking on either of the jetties.